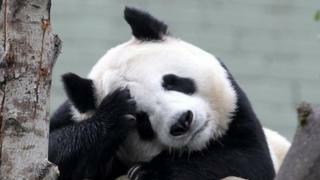 Edinburgh Zoo has said it believes its panda Tian Tian is pregnant and may give birth at the end of the month. She was artificially inseminated earlier this year after attempts to bring her together with male partner, Yang Guang, failed. The zoo said new scientific tests had given a "strong indication" of pregnancy, but were "too new to be definitive". Tian Tian also conceived last year, but the pregnancy failed. Iain Valentine, director of Giant Pandas for the Royal Zoological Society of Scotland, said: "The latest scientific data suggests Tian Tian the giant panda is now pregnant and that implantation has taken place, therefore she may give birth at the end of the month. "This is all very new and complex science and we still have a bit of time to go yet. "As like last year, the late loss of a cub remains entirely possible." The zoo said it had been able to confirm that Tian Tian did become pregnant last year. However, it said it was most likely that she had reabsorbed the foetus late term. The two pandas arrived in Scotland from China in 2011. Tian Tian has had cubs in the past in China, before she came on loan to Edinburgh. If she does have a successful delivery, it will be the first time a giant panda has been born in Britain. The panda enclosure at Edinburgh Zoo is due to close to visitors from Saturday ahead of a possible birth.